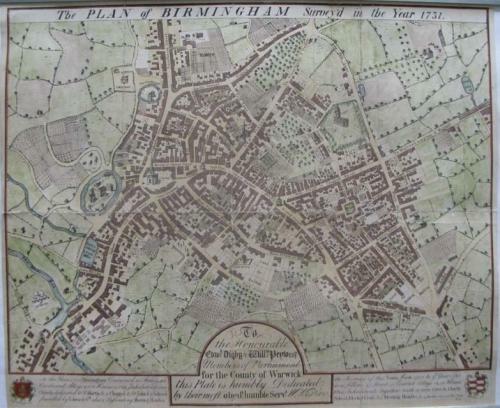 The first plan of Birmingham, presented here in a later edition. William Westley was a Birmingham surveyor. He owned land between Dale End and Steelhouse Lane. On this map 'Westley's Row' runs west from John Street. It appears on Bradford's map of 1751 as Westley Street, but by 1781 had been renamed as London Prentice Street. At this time St. Philip's church was on the edge of Birmingham, with farmland stretching to the north beyond. The land immediately to the west of St. Philip's had been sold at the end of the seventeenth century with the condition that it should only be used as agricultural land for the next 120 years. There was a pleasantly rural view from St. Philip's until the early nineteenth century, although the town of Birmingham had grown considerably beyond these fields. Please note - West is at the top of this map, rather than north. In very good condition, a few minor repairs to the folds and backed on linen.